Despite a shaky showing in Little Rock, the Ole Miss Rebels currently sit at 5-2 after their comeback win over Arkansas on Saturday. With the Auburn Tigers limping into Oxford this week after their upset loss to Tennessee, the Rebels will be looking to match their win total from a season ago when the 11 a.m. kickoff rolls around on Saturday. Here are five keys to Ole Miss gaining its sixth win of the season when the Orange and Blue roll into town. Defense has been the main issue for the Rebels this season, and the Landshark D once again looked flat for part of the game on Saturday. Although some mistakes were made and big plays allowed, Ole Miss only surrendered six points in the second half against Arkansas, paving the way for Jordan Ta’amu & Co. to lead the ferocious comeback. Auburn’s offense has looked anemic as of late, especially in last week’s loss to the Volunteers. Ole Miss doesn’t have to force a punt every possession, but holding the Tigers to field goal attempts could prove to be enough to escape with a win. Among factors that led to Ole Miss’ comeback win last week was not just Jordan Ta’amu’s arm, but his legs. Ta’amu led the team in rushing with 141 yards on 17 carries and a touchdown. If offensive coordinator Phil Longo dials up the QB draw and a high number of touches for Scottie Phillips, the pass game will open up, and the Rebels can move down the field efficiently. Although Auburn has a stout front seven, establishing the run early will be key to the Rebels knocking off the Tigers. This should go without saying, but, as mentioned previously, Auburn has a tenacious front seven. Ta’amu, as is the case with nearly every quarterback, struggles under duress, and his ability to pass and run without pressure on Saturday will be key to the Rebels pulling out the win. Although Ta’amu was sacked twice during Ole Miss’ win over Arkansas last week, he had enough time to go 26-35 through the air and garner 141 yards on the ground. The Ole Miss offensive line will have to be on its A-game if the Rebels want a similar result on Saturday. The Rebels are giving up more than 200 yards per game on the ground, which is not a recipe for success in the SEC. Since Auburn quarterback Jarrett Stidham has not been sharp as of late, it stands to reason that the Tigers will try to attack Ole Miss’ weakness in its front seven. If Auburn is able to run the ball with success, it could open up the passing game and make life a little easier for Stidham against the depleted Rebel secondary. 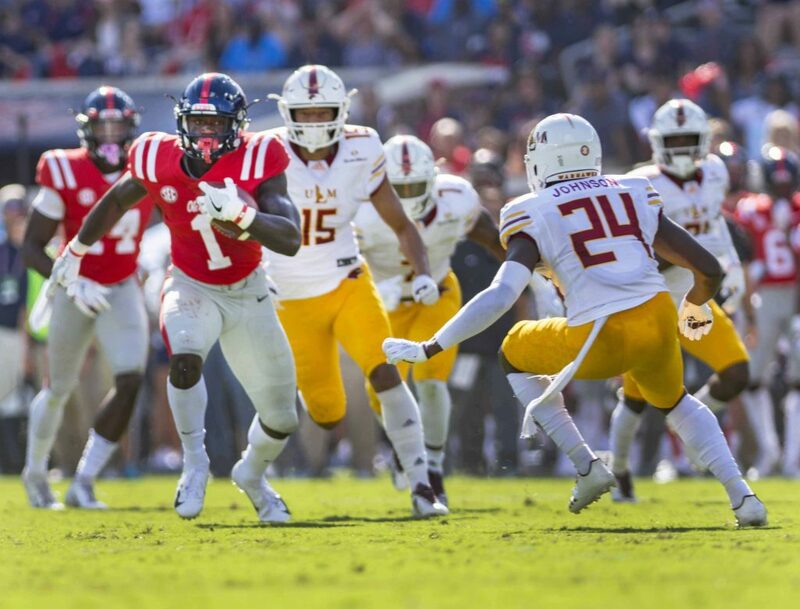 Stopping the ground game will be crucial to Ole Miss’ success and could be the primary determining factor between a win or a loss. Stidham went 28-45 through the air last week against Tennessee with two touchdowns and two ugly interceptions. Part of Auburn’s struggles of late have been due to the fact that its offense hasn’t been as productive as originally anticipated, and part of that blame lies with Stidham. The quarterback once believed to have the potential to lead the Tigers to the promised land has not lived up to that potential so far this season. That could all turn around against this subpar Ole Miss defense, however. If Ole Miss hopes to win, it first needs to stop the run. Once it forces Auburn into a pass-first mentality, it needs to wreak havoc on their junior signal-caller. Putting Stidham under pressure has proven to be a key in stopping the Tigers’ offense in 2018, and doing so could force him into turnovers which could turn the tide of the game. A win on Saturday lies largely in the hands of the Ole Miss defense, and they’ll need to cause chaos if they hope to send the Rebel fans home happy.